"Now, an ambitious program that's caught the philanthropic attentions of some of Australia's biggest companies. Called One Laptop Per Child, it aims to deliver a computer loaded with educational programs to every child aged between four and fifteen years in hundreds of remote and outer-regional communities around the country. The program is the local extension of a global effort to give laptops to children in developing countries. And yesterday in a remote northern territory town it moved one small step closer to achieving its Australian goals..."
Read the full transcript and access an inspiring video here. I am a retired ESL teacher & new volunteer for One Laptop Per Child. My job ? 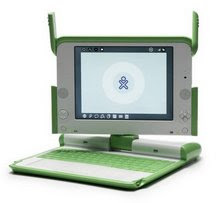 Making a " OLPC Global Annual Contest." Prizes : GOLD, SILVER & Bronze ribbon & certificate for each category. What do you think ? Love input !